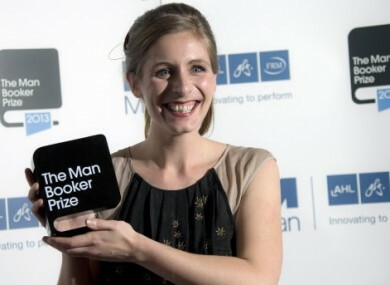 Eleanor Catton all smiles after winning the Man Booker Prize for Fiction. ELEANOR CATTON BROKE two records this evening by becoming the youngest ever winner of the Booker Prize for the longest ever novel to win. The 28-year-old New Zealander won the fiction award for “The Luminaries,” an ambitious 832-page murder mystery set during a 19th-century gold rush. The choice should give heart to young authors of oversized tales. Catton is the youngest writer and only the second New Zealander to win the prestigious award, her epic novel is easily the longest Booker champion. “It is vast without being sprawling,” he said. “You begin it, feel you are lost, think you are in the clutches of a big, baggy monster … but soon realize you are in something as tightly structured as an orrery,” a device for measuring the planets. She also beat Ireland’s Colm Toibin, Indian-American writer Jhumpa Lahiri, Zimbabwe’s NoViolet Bulawayo and Canada’s Ruth Ozeki. Catton received her trophy, which comes with a £50,000 cheque, from Prince Charles’ wife Camilla, the Duchess of Cornwall, during a dinner ceremony at London’s medieval Guildhall. “The Luminaries” centres on a man named Walter Moody who comes to a New Zealand prospecting town in 1866 and finds himself immersed in a web of saloons, seances and skullduggery. The book’s elaborate narrative is structured according to astrological charts. It consists of 12 sections, each half the length of the last, from a 360-page opener to a final chapter of a single page. Macfarlane said the novel “requires a huge investment from the reader” but delivers big returns. “It begins in fixity and then it accelerates out of it, and once you are on the down slope, the pace is irresistible,” he said. He said it was a book that “takes place in a culture which is utterly capitalised” and focused on money, but also dwells on tenderness and love. Macfarlane said the panel of five judges met for two hours — brief by Booker standards — to choose the winner, which was decided without a vote. “No blood was spilled in the judging,” he said. This is the last year that the Booker, founded in 1969 and officially named the Man Booker Prize after its sponsor, financial services firm Man Group PLC, will be open only to writers from Britain, Ireland and the Commonwealth of former British colonies. And its sheer size, eight times the length of Toibin’s 104-page “The Testament of Mary”, had an added benefit for the judges. “Those of us who didn’t read it on e-readers enjoyed a full upper-body workout,” Macfarlane said. Email “Eleanor Catton becomes the youngest ever winner of the Booker Prize”. Feedback on “Eleanor Catton becomes the youngest ever winner of the Booker Prize”.